16-year-old Kelsey got a little more than she bargained for at San Diego’s Comic-Con last week: She found one of the four copies of BIG MOUTH that were “lost” at the convention. 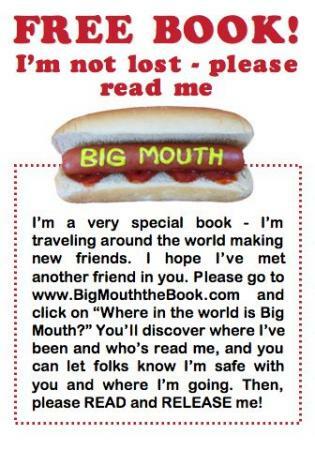 If you want to see where Kelsey plans to “lose” the book when she’s done reading it, go to the “Where in the world…?” page on www.BigMouthTheBook.com. Wait, what did you say? What is Comic-Con? You must not be from San Diego! Comic-Con (officially “Comic-Con International”) is an annual multigenre fan convention founded in 1970 by a group of San Diegans. The four-day event is held each summer at the San Diego Convention Center. Originally showcasing comic books, science fiction/fantasy and film/television, and related popular arts, the convention has expanded over the years to include a larger range of pop culture elements, such as horror, anime, manga, animation, toys, collectible card games, video games, webcomics, and fantasy novels. The first Comic-Con gathered just 300 people. Now, the convention is the largest of its kind in the world, filling to capacity the San Diego Convention Center with over 125,000 attendees in 2007. When I was a ‘professional video game player‘, I attended Comic-Con. That was in 1994, I think. The event was still just a sprout. Now, it has grown so big that it takes over the city of San Diego for 4+ days. Hotel rooms are booked, freeway traffic rerouted, downtown restaurants packed. My husband and I have walked around the convention center every Sunday for years with my parents, adding the boys to the walk when they were born, and Comic-Con Sunday is by far our favorite. Comic-Con attendees often come in costume, walking around all day every day as characters from Star Trek, Lord of the Rings, popular comic books, etc. You never know who you’ll spot roaming around the convention center. And Comic-Con’s autograph session list cracks me up. It ranges from full-fledged legends of the comic book industry to random entertainers like Eric Estrada (anyone remember “CHiPs”?) and Erin Gray (of “Buck Rogers” fame . . . decades ago!). Why, Deepak Chopra was signing there last week. I love the eclectic menu. But best of all is the fact that everyone walking into Comic-Con has a huge grin on his/her face. Everyone. People are genuinely excited to attend. So I’m truly thrilled that BIG MOUTH passed through there. Thanks, Kelsey, for letting me know you found a copy at the convention, and for being willing to “lose” the book when you’re done with it. I swear, BIG MOUTH will be better traveled than most humans. What fun! “Where in the World…?” tracks copies of BIG MOUTH and HONK IF YOU HATE ME as they are “lost” in public places around the world, then found and read and “lost” again. You can read the stories and see a map of the finds on www.DeborahHalverson.com or www.BigMouthTheBook.com. Filed Under: Adventures in Writing, Especially for Teen Readers, News, Where in the World...? Friday was Star Wars day. That’s when our crew went and has gone the last couple of years.